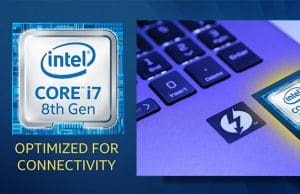 As of late August 2017 Intel announced the first quad-core eight-thread platform designed for ultra-portable computers. The CPUs in this line are sold as 8th generation processors, although in reality they are an update of the 7th generation hardware line and are called Kaby Lake-R (efresh). According to Intel’s new naming policy, the 8th gen series includes these KabyLake-R CPUs already released, but also the Coffee Lake and Canon Lake CPUs that will be released in the future. However, that shouldn’t matter much to you as a potential buyer. The platform’s particularities on the other hand should, and we’ve already spent time with two laptops (Acer Spin 5, Asus Zenbook UX331UN) built on the entry-level processor of the 8th gen line, the Core i5-8250U. The paragraphs below include our impressions, benchmark results and comparisons to the existing Core i5-7200U and i7-7500U CPUs. But first, here’s what you should know about the Kaby Lake-R platform. It includes 4-core 8-thread Core i5 and i7 processors built on a revised 14+ nm lithography, with a TDP of 15 W and support for up to 32 GB of up to DDR4-2400 memory. They also integrate the same Intel HD 620 graphics chip that’s part of the dual-core KabyLake processors. 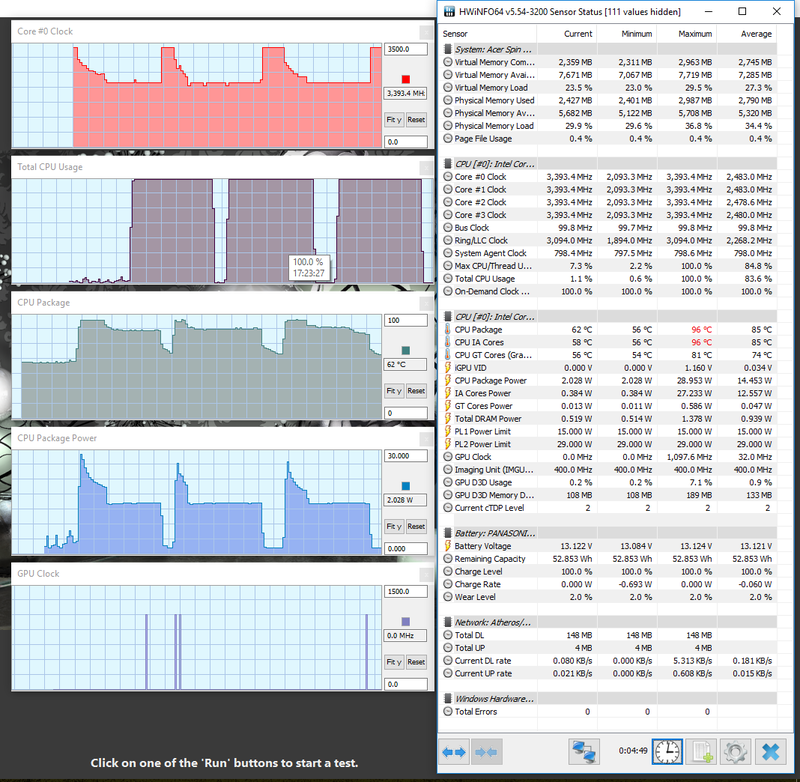 However, in order to accommodate the 2x number of cores, the default speed per core is lower on the quad-core models, with Turbo Speeds compensating for that with most loads, and as you’ll see below that’s both a fast performing and an efficient solution. The Kaby Lake-R CPUs will make it into a large numbers of ultraportable laptops and mid-tier full-size notebooks, with or without dedicated graphics. We compiled a full-list of all these laptops in this dedicated article. With that in mind, let’s get to the main topic of this article, the Core i5-8250U processor. You’ll find the important technical specs below. And here’s how it compares to the dual-cores and the Core i5-7300HQ, the closest quad-core alternative available until now. Alright, so compared to the i5-7200U and the i5-7500U, the newer i5-8250U has two more cores and four more threads, more Cache memory and slightly faster Intel HD 620 graphics capable of reaching marginally higher Turbo Speeds. The base CPU frequency on the other hand is much lower, but the Turbo Speeds are comparable or improved over the dual-core i5s and i7s, and that’s why the i5-8250U is a match for the dual-cores in terms of single-core performance and a big step-up in multi-core activities. More about that in a bit. 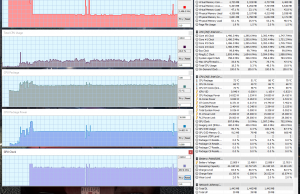 Compared to the i5-7300HQ, the i5-8250U is a lot more efficient, gets four more threads and more cache. As far as performance goes, well, here’s what to expect. While I don’t believe synthetic benchmarks make much sense for real-life use, they’re the best way to actually fair these CPUs one against the other. We ran a couple of CPU benchmarks, and the results are below. The i5-8250U results are based on two review units (S1, S2) we’ve spent time with. Keep in mind they’re both pre-production samples and these numbers might actually improve with better optimized drivers down the line. Both worked fine though and I’m comfortable to say that’s mostly what we should expect from this CPU. The other results are based on our reviews and the averages for those CPUs from notebookcheck.net, as they have a larger pool of reviews in their database. Overall, the i5-8250U improves on all the dual-cores on multi-core performance and it beats the i7-7500U in terms of single-core performance in most tests. 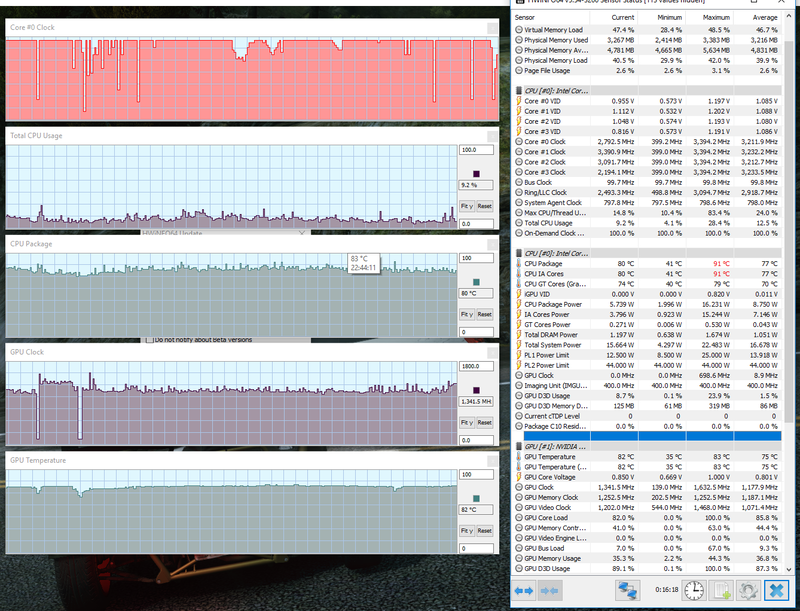 It’s neck in neck with the i5-7300HQ CPU in multi-core benchmarks though, despite having four extra threads, and that’s because the i5-8250U cannot maintain 3.4 GHz Turbo Speeds in continuous full loads (Cinebench, x264 Bench). I noticed the same behavior on both our samples, as you can see in the pictures below. The CPU maintains high Turbo speeds for a short while, which is corroborated with a package TDP of 25 W or higher, but after a few seconds it drops to the standard 15 W TDP and the frequencies drop to 2.2 – 2.3 GHz. That means that if you need the best option for multi-core performance, the 45 W Core i7 HQs are still the ones to get right now, but the i5-8250U is there next to the i5-7300HQ in most cases, while requiring a third of the power. We also ran a couple of GPU benchmarks for the Intel HD 620 chips on the i5-8250U configurations and we’re comparing the results to the average HD 620 results from notebookcheck.net. Nothing unexpected here, the results on the i5-8250U are a little higher than the norm, as the chips can reach slightly higher Turbo Speeds. There’s also the topic of gaming on an the i5-8250U configuration to discuss, but I can’t draw any firm conclusions based on our two samples. 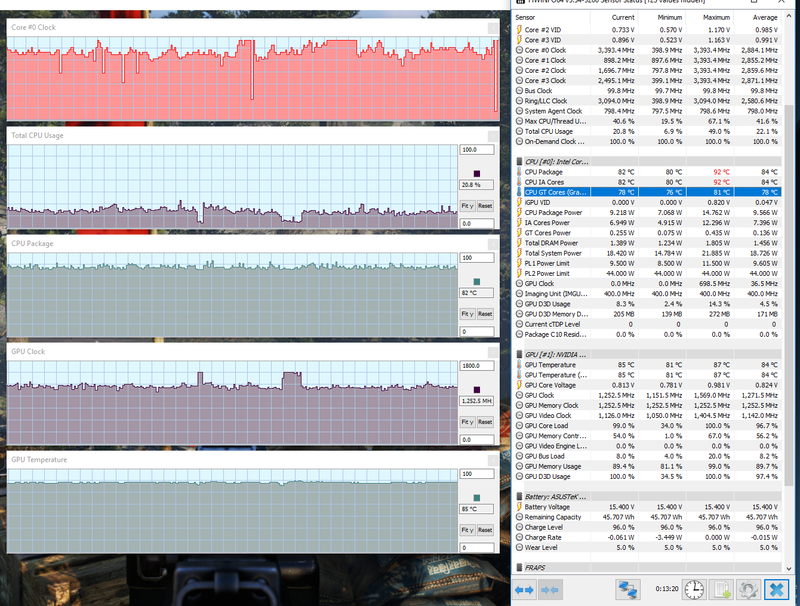 What I can tell you is that the CPU wasn’t be able to maintain 3.4 GHz speeds in recent games on either of the units, with a significant drop on the configuration that relied solely on the i5-8250U and the Intel HD 620 integrated chip (S1 in the pics below), and a smaller loss on a configuration that came with dedicated Nvidia graphics on the side (S2 in the pics). That makes sense, as the GPU integrated withing the processor is inactive in this latter case and as a result the actual cores can run at higher frequencies, not having to share energy with the GPU, within the TDP restrictions. I’d reckon you’ll also be interested on the matters of temperatures, noise and battery life for the KabyLake-R configurations, and while I don’t want to generalize and I encourage you to read the specific reviews for the devices you’re interested in, I can say that these are on par with what we’ve seen on dual-core Kaby Lake builds in the last year. With all these in mind, if I were in the market for a high-performance ultraportable right now, I see no reason why I wouldn’t pick one of the KabyLake-R models. I would note that I can’t yet conclude on the gaming experience, due to the drop in core speeds we noticed on one of our samples, but if I were into gaming I wouldn’t rely on the Intel HD graphics anyway, but rather go with a thin-and-light with dedicated Nvidia graphics. For everyday multitasking and demanding loads that put stress on the CPU though, the KabyLake-R Core i5-8250U is an obvious pick over the dual-core i5-7200U and i7-7500U, but also a better balanced and much more efficient alternative to the quad-core i5 HQ processors. The i5-8250U is also just a tad more expensive than the i5-7200U and about $100 cheaper than the i7-7500U, so configurations built around it should have a pretty fair price as well. Of course, the i5-8250U is just the entry level chip in the KabyLake-R series, with higher clocked i5s and i7s also available for those interested in even more power in this small and efficient package. I’ve yet to spend any time with these for now, so we’ll talk about them in future posts. Bottom point, the quad-core Core U CPUs are one of the most significant upgrades we’ve seen on thin-and-light ultraportable laptops in the last years, and they’ll make their way into a bunch of devices in the second half of 2017 and later on. Here’s a full list, and stay around for reviews and updates. That aside, the comments section is wide open, so get in touch if you have anything to add, any questions or any feedback. Thank you for such an honest review. 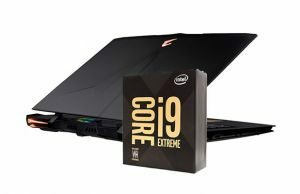 I found the information I needed to make a decision whether to buy or not the laptop with KabyLake-R. Miracle has no happened. Thanks for the review. Is it safe to say that for video editing it will be better to buy now I7 7700HQ over i7 8650u? Have you done any testing with a eGPU yet? Can these or the i7 quad core U version power a higher end GFX card for gaming? I'll have a post on a laptop with this i5 and Nvidia MX150 graphics. Perhaps some OEMs might pair these quad-core 15W CPUs with gtx 1050s, but I doubt we'll see them on full size gaming laptops. Once portability is not a concern, the 45W quad-cores make more sense performance wise. Yeah, I've heard, but from what I've seen these configs come with AMD graphics, not with the 1060 that's available on the standard y720. One comment: could it be possible to update the table as the iGPU line for the 8th generation is called UHD, not HD? I will, but it's pretty much the same chip, just a minor bump in frequency. Sorry, but i'm just a little curious. If I'm getting a laptop for graphic design purposes (Adobe Illustrator, Photoshop & basically Adobe Suites). Which of the processor (i7-8550U & i7-7700HQ) would perform better? the i7-7700HK, but it would depends on your loads and activities. For basic things, the U will do as well, for heavier use that put as train on the CPU, the HQ is the better pick. May I know what are some examples of heavier use? edit a longer movie in Premiere, edit a bit batch of photos in Premiere, apply complex effects in Photoshop, run virtual machines, etc. The i5 7300hq is with 6GB of chache not 4GB. The bus speed of the i5 7300hq is 8 GB/s and for the i5 8259u is 4 GB/s and the PC lanes 16 vs 12 for the i5 8250u. Will teh Lenovo Y520 be released with the new i5 8250u , when and what will be the price? What will be the better decision to buy now a Lenovo Y520 with i5 7300u or wait for a new with i5 8250u? Thanks, updated. Not sure about the Legion, but if I'd want the laptop for demanding loads and even gaming, I'd probably get the i5-7300HQ configuration. As an allrounder, the Core U i5 is better balanced: still fast enough, but more efficient. Finishing it up right now. So today or tomorrow. I really love your review. I was thinking to buy a MacBook Pro 13 to replace my old MacBook Air. But I see the 8250U with 40% increase in performance, sounds amazing. What about the battery life? 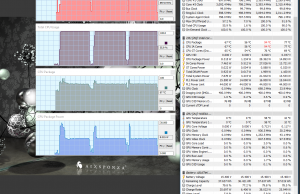 Will the 2 more cores increase power consumption? Do you think it worth the wait to buy a MBP 13 next year? Probably another 6 month waiting……. You should read some user reviews. The 13-inch MBP is a nice laptop, but expensive. As long as you can live with a Windows laptop, you'll probably find better value for the money in this camp. These CPUs down-clock when they don't have to run at full-speed and have the same TDP as the previous dual-core ULVs. In theory, that means they don't need much power, and based on the few laptops I've already reviewed with the i5-8250U, that's also true in real use. I have used to the mac os system in the past 5years, and dont think I can go back to windows right now. The current MBP13 equipped with the 7267U, compare with the 8250U, what's the real world difference? 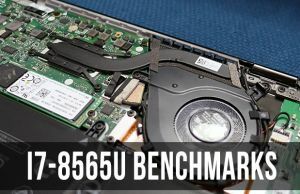 The base clock of the 8250U only has 1.6GHZ, will this become an issue compare with the 3.1ghz 7267U? Multi core performance is better on the quad-cores like the 8250U and 8550U, but it will be hard to actually notice that in real life. 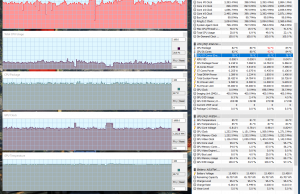 Performance shouldn't be a concern on the 13 MBP imo, my nits are with the keyboard and battery life. I haven't used it extensively so I'm not going to say more thant hat, but you'll find a lot of opinions about it online and on Youtube. Nice review! My laptop died recently and I'm shopping for a new one. I looking at a Lenovo Flex 5 with an i5-7200U processor. I don't do anything that you've defined as "heavy use". I mainly surf the web, stream movies, edit the occasional photo and use Word and, to a lesser extent, Excel. Should I wait for Lenovo to upgrade the processors in the Flex line of laptops? Or am I OK getting one with a 7th Gen processor? No, the i5-7200U is a solid option for your needs. Make sure to get at least 8 GB of RAM and if the budget allows, an SSD, it's going to make a big difference. Your review was really helpful. I want to buy HP Pavilion cc102tx with an 8th gen i5-8250 processor. Would that be okay for my requirements mentioned below? I will be doing mild photo and video editing along with gaming like GTA 5, COD MW4. Could you please help me with this decision? I'd say yes, but only as long as the software you're using knows how to use the four cores and eight threads. So I am looking for a new laptop and its hard for me to decide what is the best choice for me. I need it for using Autocad and regular use for studies. Not for games. Can you recommend me some specificatios that wuould be enough for my usage. I can't decide should I buy a gaming lapopt, because it has good specs for a better price or it would be enough for me to buy smaller and lighter laptop with, for example:i5-7200U,NVIDIA® GeForce GT 940MX,8gb ram..? bugdet is under 1000$. Thank you very much! good article. I am not a computer geek, don't understand a lot of what makes one laptop better than another. I am looking for a laptop for my 14 year old. She is not a heavy gamer. Plays a little minecraft, watches you tube, and Netflix. I will use it for editing pictures. I am considering HP 15-BS015DX – 15.6" HD Touch – Core i5-7200U – 8GB Memory – 1TB HDD or HP Pavilion 15-cc123cl Touchscreen Laptop – Intel Core i5 •Intel Core i5-8250U Processor at 1.6GHz. The i5-7200U processor speed is 2.5 ghz. So is the i5-7200 faster than the i5-8250? which is a better speed/performance laptop? What's your budget? The i5-8250U is the one to aim for, it's faster than the other i5s and about the same price, but it's part of newer configuration and in the end you'll probably end up paying more for one of these. Still, that's what I'd get, preferably with 8 GB of RAM and some sort of SSD storage. SSD is faster than the HDD and its perhaps the single most important upgrade you can make to get a computer that feels very fast. If the budget doesn't allow to get an i5-8250u laptop, get an i5-7200U, but with 8 GB of RAM and SSD. Hope this helps, please get back if you have other questions. around $500. This is the it-8250 I was looking at. It has SATA. Don't think laptop with SSD is in my budget. This 85=8250 has only a 1.5 mgz processor compared to the it-7200U that had 2.5 ghz. Well, I wouldn't get either. I'd rather get something like this around that budget: amazon.com/Acer-E5-575G-57D4-15-6-Inches-Notebook-i5-7200U/dp/B01LD4MGY4/ . SSD and better screen, plus it's been available for a while and you can read about the negatives. Don't worry about those differences in speed, modern processors have a default speed (1.5 vs 2.5), but also Turbo speeds and the CPU can boost to those when needed. In reality the i5-8250U works at Turbo speeds when required and is faster than the i5-7200U. Withing your budget you'd be better with an i5-7200U configuration and preferably a better screen and perhaps the SSD. Maybe you can find some other deals these days, Dell and Lenovo tend to have good discounts as well. I ordered the Acer-E5-575G-57D4 from Amazon today. Thanks for your input. Hope it works well for you. Please let me know. The 7300HQ will probably outperform the 8250U in most high-load everyday tasks, because most apps are not going to benefit from the increased number of threads of the U version and rather favor the higher- base clocks of the HQ CPU. And that's because with demanding loads the Core U clocks down, it's designed to behave like this in order to remain within its 15W power package. Thank you for the great, in-depth review. I'm in no way a computer guru?! My computer usage mainly consists of surfing, some youtube, some limited photo editing (cropping, brightness, etc. ), and creating videos of grand-kids from photos and videos that I've taken. I tend to keep computers for a long time. These are all currently at $699. If there is something less expensive that would work well for me, that would of course be great. – Would you suggest one of these or a different 2-in-1? 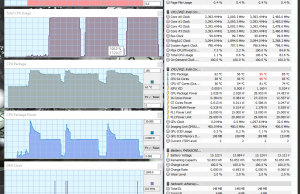 – You replied to someone above about making certain the video editing software knows how to use the four cores and eight threads of the i5-8250U. What software would you suggest for creating videos and photo editing? I'll start with the end of the comment. Premiere known to use the 8-threads, but favors higher frequencies, and these 8th gen processors run at lower speeds than the previous dual-cores with continuous loads. I haven't personally compared performance in Premiere and other editing software, but perhaps you can find some data about it on Youtube and the forums. As far as the options go, all those have their pros and cons. Costco is unfortunately not loading with my ISP so I can't check out the exact configurations, but make sure they have an IPS screen, 8 GB of RAM and preferably SSD storage. Out of those three, I've only properly reviewed the SPin 5 and is a pretty solid option, but the other two aren't bad either. Make sure to read some reviews and narrow down their pros/cons and decide based on what matters more for you. Hi … Thank you for the reply and feedback. I'll look into premiere and see what I can find out. The laptops all have: 8GB RAM, 256 SSD, and IPS screens. Lenovo and Acer have i5-8250U, while Dell is i7-8550U. Lenovo does have 256GB PCIe SSD and 2GB NVIDIA GeForce 940MX Graphics. Thank you again for your educated input. Well, if you're going to play any games, the Lenovo is the better pick. Otherwise, idk, each one is OK. Is there any way you can see them in any physical store and check out the builds, design, keyboard? These things are subjective and should help steer towards one or the other. As a side note, the Dell only gets a 42 Wh battery, smaller than the others. So my final pick would be between the Acer and Lenovo. Thanks. I saw the Lenovo in store. When I wasn't into the HP screen, the HP rep working there suggested the Lenovo. It felt solid, but lighter and thinner then the Acer. It had the PCIe and extra 2GB dedicated graphics, so I bought it. Guess it's time to open it and use it?! Thanks for your input and your honest reviews! Alright, hope it work well for you. Thanks for the detailed review, really appreciate it a lot. Just wanted to ask whether it is in our hand(the turbo boost thing) or is it automactic. I also wanted to ask whether I should go for i5 7200U or i58250U if I use it for songs recording and editing purpose..?? Modern CPUs adjust their speed automatically. the i5-8250U is much faster in multi-thread applications than the i5-7200U. Is the i5-8250 better than the i7-7500?please share your thoughts on this. I am writing from Europe. I would greatly appreciate your opinion on this 2 configurations in terms performance, price and future-proof (3-4 years). Usage profile would be office (university related stuff), some occasional pictures editing and CAD. Occasionally taken around. The Aspire 7 is a nicer laptop, but that configuration only comes with a HDD and is going to be slow for daily use. Plus, if you're not playing games, you\re not going to benefit much from the GTX 1050 graphics. so among those two, I'd go with the Aspire 5 configuration and upgrade the RAM to 16 GB. There are reviews for both here on the site, if you're interested in their potential quirks. is it sign of upcoming failure? my laptop is under warranty. So the 8250u in terms of long usage is weaker then the previous gen, because it can't mantain the high frequency for long. So if I use anything that requires the cpu longer, will I see a significant drop in performance? 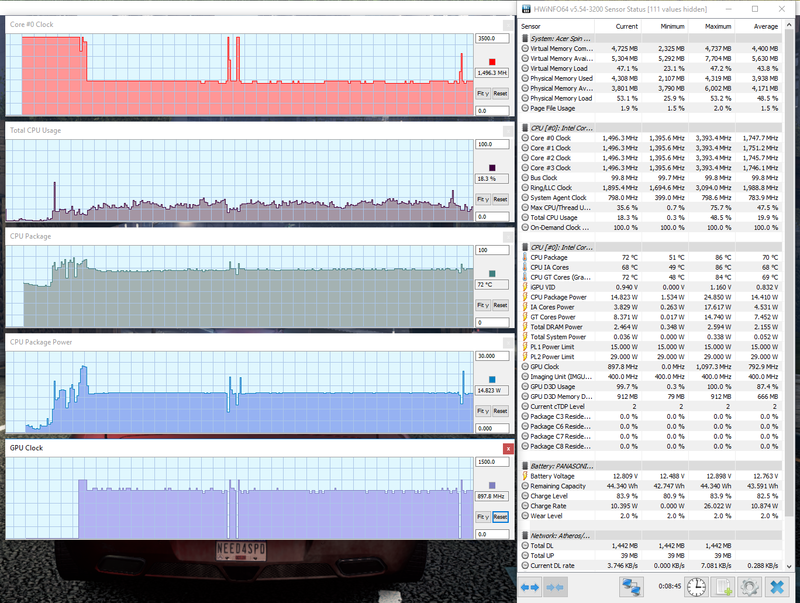 Not compared to the dual-core i5s, as you can see from the benchmarks. It runs at hiogh Turbos for a few seconds in demanding loads, and then the speeds drop, but even so the overall performance is a significant step-up from the dual cores. That is good to hear. I was a bit sceptical about the 8th gen, but I should choose this over the old one it seems. Or maybe I will wait with the new laptop buying until cannon lake comes out. The 8250U is well suited for your demands. 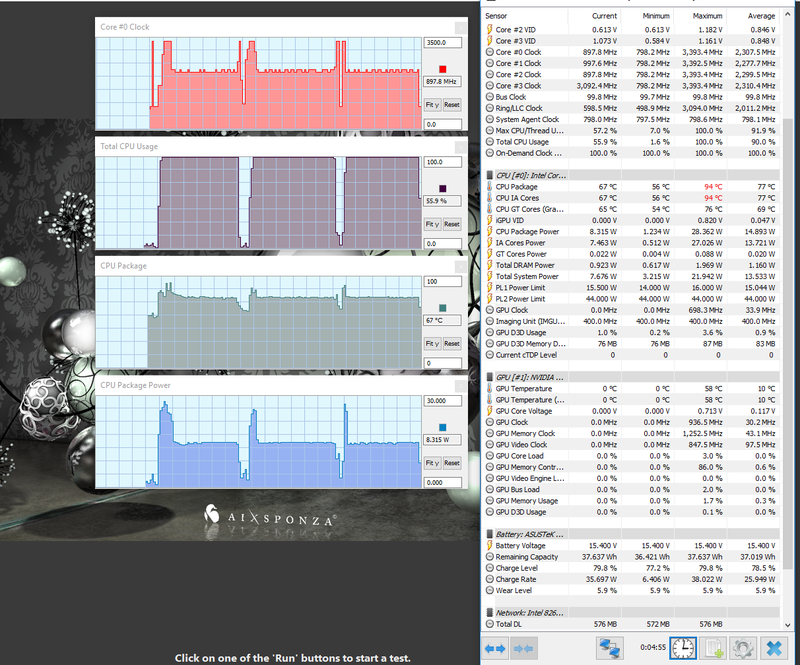 Yes it has a lower default clock speed than the dual-core i5-7200U for example, but as you can see in the benchmarks below, it scores higher because its frequency automatically adjusts between the default 1.6 GHz frequency and the max-Turbo frequency of 3.4 GHz. This allows it to be fast when needed, but at the same time run efficiently. Unless the dual-core configs are much cheaper (and you're on a tighter budget) or you don't plan to multitask much, these quad-cores are the better choice. Why is it ever story about the i5-8250U never mentions that several Laptop Mfg's disable *Turbo Boost* to keep the Heat and Fan Noise down? (Lenovo etc). How about tell us "which Chip runs hotter…the i5-8250U or the i5-7200U ? you'd have to read reviews for that, this is a general article about the processor, but its performance and behavior differ for each implementation. Could you please offer an opinion on these two laptop systems I am trying to decide on? Take into consideration that I am not into gaming, but I am interested in a solid, well-built, reliable machine with good overall performance and specs as well as and a fairly good battery life. Any comments or suggestions are really appreciated. Looking forward to your reply. Thank you for your assistance. Both are basic in this price range. I'd probably get the Asus and add more RAM out of the box, and later on upgrade de HDD to an SSD. You could also consider increasing your budget to get something with an SSD from the beginning, makes a lot of a difference. I would like to have your opinion please. My question is:do you think that this setup will run my system for the use that I want it WITHOUT ANY PROBLEM ? And secondly, do you think that is a value for money purchase? Hi, You got the specs right, that's what I'd look at as well. You should find a few options from Acer, Asus, Lenovo, maybe even Dell and HP that should meet those specs and your budget. The IdeaPad 320 is a good laptop in its class, however the model you pointed to comes with a 1366 x 768 px TN screen which is pretty crap by today's standards. I'd rather look for something with an IPS screen instead. Thank you for your comment. I finally managed to buy a Dell , i7-7500U 2.70 GHz ,8 GB DDR4 2400 MHz, 256 GB SSD ,15.6" FHD , AMD Radeon R5 M430 2GB , Win10 at 520 Euro . What is your opinion about my purchase? Sound good. Is that screen IPS? 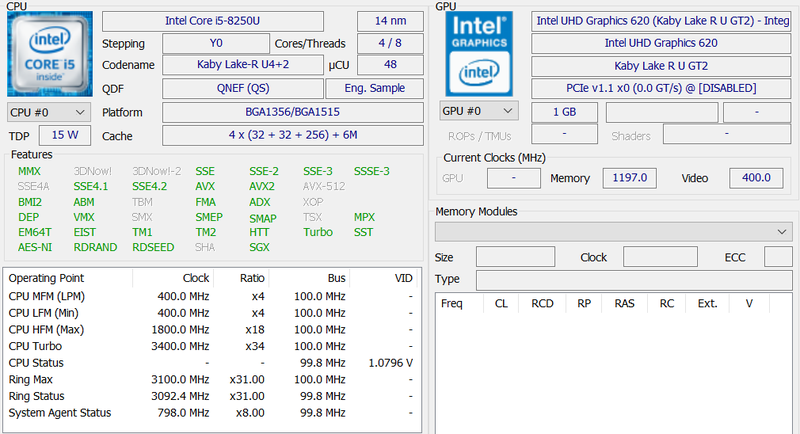 I use this CPU in my gaming laptop and it holds it's turbo clock at 3.2-3.4ghz no problems under load while gaming. it can run rather hot however so that can be a factor too. I am using a Medion Erazer laptop with 8GB RAM and the GTX 1050ti 4GB GPU. It's perfect for a little bit of gaming on the go or while at work. Could try undervolting to lower the temperatures. Thanks so much for the initial article and the follow-up commentary. After a bit of research I ordered an HP laptop with the i5 8250U, 16gb RAM and 512 gb SSD memory. With 15.6 screen and the Intel 620 GPU/functionality, I paid $829. Of course this is a little more than I wanted to spend and always want more features and performance at any price. I am a CPA and will be banging spreadsheets, financial and tax software, and project planning software. My past system ran out of horse power last year and I am hoping this one will take me into the future without too much immediate envy. I am hoping the SSD protects my data because I am mobile. Many thanks! That's worse than an Nvidia MX150, so pretty much a basic entry level dedicated chip. For that game I'd rather look for a laptop with at least a GTX 1050 inside, if possible. Maybe something like the Lenovo Legion Y520, Acer Nitro 5 or even the Asus X560 / X570 lines. . I'm confusing between these two models. My target is to browse and watching movies in Youtube, Netflix. Occasionally I will use it for coding in Eclipse IDE. Please Suggest. Thanks for the feedback.Dell is cheaper than Lenovo. ($80 US dollors less). "I’d reckon you’ll also be interested on the matters of temperatures, noise and battery life for the KabyLake-R configurations, and while I don’t want to generalize and I encourage you to read the specific reviews for the devices you’re interested in, I can say that these are on par with what we’ve seen on dual-core Kaby Lake builds in the last year." In terms of noise and temps, is a laptop with i8250 going to be noisier and run hotter than a laptop with i5 7200 — or vice versa? I'm looking at two HP machines, one with 8250 and the other 7200, and just wondering about the general comparo in terms of noise and heat. Thanks for a terrific piece and replying to so many reader comments! Hard to say, as this would depend on the cooling implementation of each particular laptop. However, as a whole, temperatures should be similar for daily use, but the i5-8250U should run hotter with more demanding loads. Differences should be small though. My main use would be editing photos in Lightroom and Photoshop (not running both programs at the same time. Would this laptop be suitable for this purpose? Adobe's website says minimum system requirements are "Intel® Core 2 or AMD Athlon® 64 processor; 2 GHz or faster processor" and I know this is only 1.6 GHz. Any guidance would be greatly appreciated!! I cannot access office depot here in Europe. Can you give a brief specs list: CPU, RAM, Storage? Also, price? "2018 HP 17.3 Inch HD+ High Performance Laptop | Intel Core i5-8250U Quad Core | 16GB DDR4 | 256GB M.2 SSD+ 1TB HDD | Intel UHD Graphics 620 | Backlit Keyboard | Webcam | Windows 10 | Gold color "
Aside from the usual multi-tabbed browsing and Netflix streaming, I dabble in photoshop and use MS Office for work-related things and python coding in an IDE. I'm assuming this will run quickly even when all done together, and hope the SSD as the boot drive will keep startup quick. Thoughts? 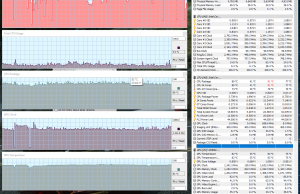 I'm not familiar with those pieces of software, but I think the i5 should handle most loads well. Just make sure to give it a proper test within the return window, just to make sure everything runs as you want. A great article and the replies thread makes interesting reading. I am looking to upgrade my old Samsung Series 9 (i5-3317U) to an Asus Vivobook S14 or S15 which will only be used when travelling for image editing (perhaps maybe stitching a panorama) in Lightroom/Photoshop. Will the i5-8265U CPU rather that the i7-8565U be sufficient for my needs? I will be upgrading the RAM to 16/24 GB on purchase.